Are you looking to add a few stamps to your passport and you want to encourage the beau to join you? Nothing hints at travel better than a leather passport holder from Global Jet Black. 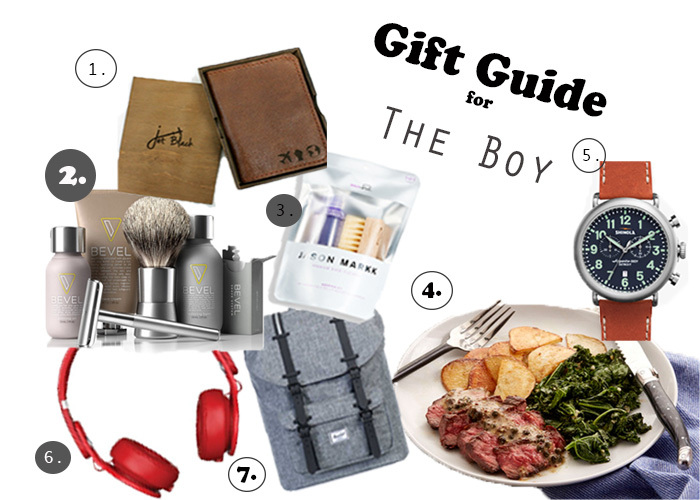 Give him the gift of the best shave he’ll ever have with this shave system from Bevel. Bevel, also, has a quarterly subscription service. Every three months when the products arrive, your boo will be reminded of you. Tiff Tip: Securing this subscription service and getting a nice card to announce the subscription is great for the last minute gift that doesn’t feel so last minute. This one is for the sneaker head who likes to keep a fresh pair of kicks. Tiff Tip: If you know your man’s style, pair this kit with a fresh new pair of sneakers. How about a date night at home during these colder months? Get bae the gift that keeps on giving with this subscription meal service from Blue Apron. If he has a culinary spirit, this is the perfect way to tap into those skills. I’m not only recommending this brand because it’s manufactured in the city of Detroit (whaddup doe? ), it’s actually a very well-made retro vibes kind of watch. Elevate his style with the Runwell Chrono Watch. The music enthusiast will appreciate his sounds resonating from these headphones. They will, also, make him look pretty cool. Sometimes, that’s what it’s all about. 7. ‘Little America’ Backpack from Herschel Supply Co.
Herschel Supply Co. has the best backpacks and duffle bags in the game right now and the price point is spot on. The boy will enjoy carrying his man-things in this on trend backpack.